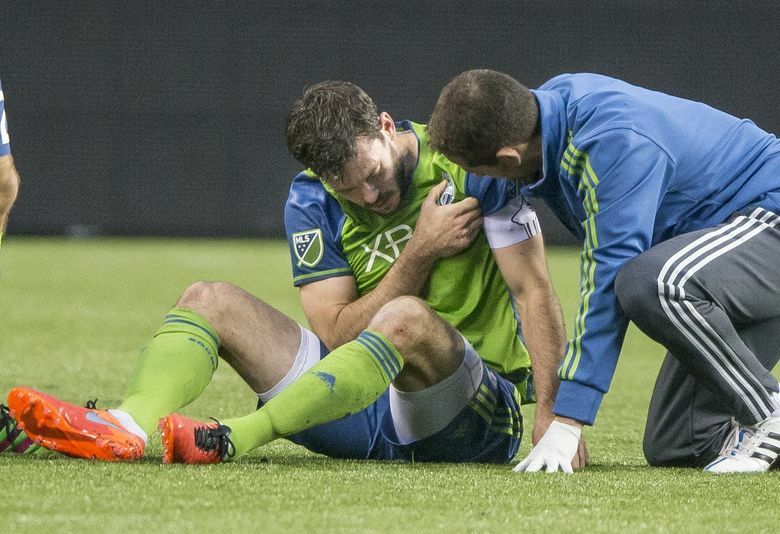 Seattle’s Sunday went from bad to worse as Brad Evans’ left shoulder popped out of its socket as he landed on the new CenturyLink Field turf with force. But as painful as the blow undoubtedly was in the moment, Evans could return to action as early as next weekend at Real Salt Lake. Seattle’s Sunday went from bad to worse as Brad Evans’ left shoulder popped out of its socket as he landed on the new CenturyLink Field turf with force. The captain had leapt high to win a header, while Sporting KC forward Dom Dwyer pulled out of the challenge early. Evans flipped over Dwyer on his way down, motioning to the sideline with his still-functional arm as soon as the pain hit. Dylan Remick filled in for Evans, who winced on his way the sideline. He walked around the locker room afterward in a sling. But as painful as the blow undoubtedly was in the moment – and probably will be Monday morning – Evans could return to action as early as next weekend at Real Salt Lake. Tyrone Mears, a late scratch with a quad injury, should return to full training on Wednesday and be available next Saturday as well, while midfielder Erik Friberg continues to undergo concussion protocol. Friberg, who has a black eye in addition to the concussion he suffered colliding with teammate Chad Marshall during a Champions League game Wednesday, at least has a sense of humor about it. “I picked the wrong guy to run into,” Friberg said. The 20-year-old St. Vincent and the Grenadines international showed every bit of that trickiness on Sunday during his MLS debut as a substitute. Anderson won two fouls in seven minutes of game action, at one point losing his shoe while bursting down the left flank. Anderson scored four goals in 16 appearances with S2 in the USL last season. He was less impressed than Schmid with his debut. • Sunday marked only Seattle’s third loss in eight all-time season-openers. The Sounders have opened the campaign at home during each of their MLS seasons. They previously defeated Sporting KC 1-0 in the 2014 curtain raiser. • The loss snapped an eight-game regular-season winning streak stretching to August of last year. • The announced attendance at CenturyLink Field was 39,525.